I guess you could call this a negotiation. It’s been tense at times, funny at others, always filthy. We’ve got serious guide books for most of your major life forms aboard Escape Velocity. None more serious or baffling is a tome called Sea Birds by Peter Harrison, The Identification guide to the worlds sea birds. It’s left us scratching our heads just about every time we’ve picked it up. The first time we noticed “Cochran,” well I didn’t really see him, I noticed guano dripping down our stern stadium seat. I said to Marce,”there must have been a booby on the roof tonight.” Now, I like birds. We’ve been marveling at their grace and beauty as they carve turns to swoop down touching the surface of the waves with their wing tips. 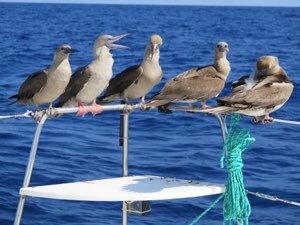 We rarely see this lot dive into the ocean but while in the Galapagos boobies dove from fifty feet at high speed, smacking the water all around us. My theory is that these guys were sent out to catch fish and told not to come back until it was their turn to watch the eggs…so what’s the rush, who brought the beer? So, as I say we’ve been watching them try out several strategies for landing on a bucking catamaran and apparently it’s not so easy. So with a prudent amount of caution I peeked over our Bimini roof. Hmmmm, grayish brown, beige body, red feet, guilty look. Mr. Harrison lists no such bird. Marce says, “that must be Cochran.” When I crept closer I got the hey this is my spot, indignant booby look. I asked him to leave but he wouldn’t hear of it. I took a quick look around and knew he had to go. Yelling, arm-waving, and towel-snapping didn’t work. Shoving with a boat hook did. Let me add that no birds were hurt during the telling of this tale. What followed was more like a Keystone Cops short than anything. Suddenly they all knew the secret of how to land on EV. I’d see one flying by and he’d look over at us and you could just see him thinking hey, sweet ride. It didn’t help that we’d sailed into a wind hole and were just ghosting along for days. I was exhausted climbing out on the side deck with the boat hook to encourage some birdbrain off the roof. That’s when we decided to come to grips with our light air spinnaker. Now this thing has been stored down in our port bow locker in a large bag called a turtle since we bought EV. Oh we’ve flown spinnakers before but this one is an asymmetric type with a furler and we know that some very bad things can happen if and when things don’t go well with spinnakers. Oh what the hell, how hard could it be? It was nip-and-tuck but we flew our green and white spinnaker all day and got it back in the turtle before night fall. Just a polite smattering of guano from the judges.